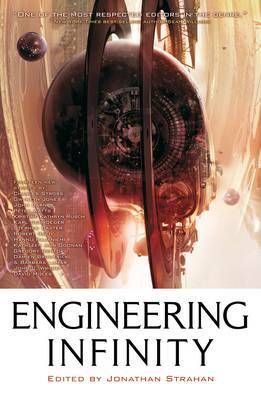 Engineering Infinity is a rare beast in the land of anthologies: it takes its theme and it nails it. Themes can be nebulous things, reliant on perspective, but here the award-winning Australian editor Jonathan Strahan collects fourteen stories that take his vision and run with it: they examine, as Strahan says in his introduction, “the point where the practical application of science meets … our sense of wonder”. The anthology succeeds on another, more important, level, too: there’s very little to fault on a story-telling level. It’s a joy to find such a consistently high standard. Peter Watts begins brilliantly with ‘Malak’, in which war machines develop conscience from algorithms and decide how best to balance their military commands with their nascent sense of morality. David Moles furthers the military complex with a story of interstellar war, tinged with futility and tragedy. Strahan remarks that the realm of hard science fiction has moved on from being a predominantly white man’s playground – he admits this anthology suggests that ‘hard’ is a more malleable material now than in its classic form – and this collection chips away at that gender reign with four women represented. Kristine Kathryn Rusch takes the trope of the over-ambitious parent and adds technology to the family in crisis; Kathleen Ann Goonan starts in Hawaii and ends up somewhere else entirely in one of the more fantastical, and probably the least thematically appropriate, of the stories. Gwyneth Jones goes off-world to find a family reunion under tragic circumstances while Barbara Lamar joins with Damien Broderick to produce some engaging time tunnelling. Time is also of the essence for Gregory Benford’s noirish manipulation of serial-killer history. Karl Schroeder blends a Cold War sensibility with the enigma of space colonisation while Stephen Baxter inverts the premise, and has them coming here in a deeply personal echo of War of the Worlds. Another classic, The Day of the Triffids, has a tendril in the closing story by John Barnes in which a strange occurrence at sea has much wider ramifications, in terms of both cause and effect. Rounding out the collection, Finn Hannu Rajaniemi throws some serious tech speak into artificial life in space while Charles Stross throws zombies into the mix; John C Wright mixes myth and technological magic, and Robert Reed provides a gym mirror with a most disconcerting view. It is a varied array of subject matter and setting, and yet it works. The strength of this anthology is that each story mixes technology with an intimate cost; even Rajaniemi’s high-tech AIs evoke raw emotion as they seek the meaning of life far out in the black. Goonan’s key technology is one of Earth’s oldest – brewing – and it’s an essential part of the plot. The stories might not, as Strahan concedes, fit cosily within the definition of classic hard SF – and why would you want them to? – but they do, universally and with surety, fit within the premise of ‘engineering infinity’, studying the grey zone between technology and humanity and the futures they might walk together.